Wilson and Drakeman, eds., Church and State in American History: Key Documents, Decisions, and Commentary From the Past Three Centuries, 3rd ed. Martínez-Fernández, Figueredo, Perez, Jr., and González, eds., Encyclopedia of Cuba: People, History, Culture, 2 vols. by Garth D. Reese Jr.
Eugene Asher Award for Distinguished Teaching-Call for Nominations, 38, 268. William Gilbert Award for Teaching Articles-2003 Recipient Named, 250, 350. Black, Brian, "Thickening Our Stories: Models for Using Environmental History as Context," 57-66. "Doing Environmental History in Environmental Studies Programs: Introduction," by Marcus Hall, 51-55. Hall, Marcus, "Doing Environmental History in Environmental Studies Programs: Introduction," 51-55. "Keeping the Academics in Service Learning Projects, or Teaching Environmental History to Tree Planters," by Mark Stemen, 73-78. Morse, Kathryn, "Putting History at the Core: History and Literature in Environmental Studies," 67-72. "Putting History at the Core: History and Literature in Environmental Studies," by Kathryn Morse, 67-72. Stemen, Mark, "Keeping the Academics in Service Learning Projects, or Teaching Environmental History to Tree Planters," 73-78. "Thickening Our Stories: Models for Using Environmental History as Context," by Brian Black, 57-66. "Aldo Leopold: An American Prophet," by Stephen J. Frese, 99-118. Frese, Stephen J., "Aldo Leopold: An American Prophet," 99-118. "Introduction," by Nancy Quam-Wickham, 87-88. Kittredge, Jeremiah, "Presidents, Congress, and the Use of Force: A Critique of Presidential Powers," 89-98. "Presidents, Congress, and the Use of Force: A Critique of Presidential Powers," by Jeremiah Kittredge, 89-98. Chu, Jonathan M., "Risks and Rewards of Teaching Race, The," 484-93. "Comment: Meeting the Challenges of the United States History Survey," by Michael Grossberg, 512-16. Frederickson, Mary, "Surveying Gender: Another Look at the Way We Teach United States History," 476-84. Grossberg, Michael, "Comment: Meeting the Challenges of the United States History Survey," 512-16. "Immigrant and Ethnic History in the United States Survey," by Diane C. Vecchio, 494-500. Johanek, Michael, "Race, Gender and Ethnicity in the United States History Survey: Introduction," 473-76. "Race and Gender Issues on the AP United States History Examination," by Uma Venkateswaran, 501-12. "Race, Gender and Ethnicity in the United States History Survey: Introduction," by Michael Johanek, 473-76. "Risks and Rewards of Teaching Race, The," by Jonathan M. Chu, 484-93. "Surveying Gender: Another Look at the Way We Teach United States History," by Mary Frederickson, 476-84. Vecchio, Diane C., "Immigrant and Ethnic History in the United States Survey," 494-500. Venkateswaran, Uma, "Race and Gender Issues on the AP United States History Examination," 501-12. "Does Nature Have Historical Agency? World History, Environmental History, and How Historians Can Help Save the Planet," by Richard C. Foltz, 9-28. Foltz, Richard C., "Does Nature Have Historical Agency? World History, Environmental History, and How Historians Can Help Save the Planet," 9-28. "Innovative Ways to Look at New World Historical Geography," by W. Dirk Raat, 281-306. Raat, W. Dirk, "Innovative Ways to Look at New World Historical Geography," 281-306. "An Online Bibliography of Resources for the Study of Woman Suffrage," by Elizabeth Kenny Sparacino, 229-38. Sparacino, Elizabeth Kenny, "An Online Bibliography of Resources for the Study of Woman Suffrage," 229-38. Bolinger, Kevin, co-auth., "Improving Critical Thinking Skills in the United States Survey Course: An Activity for Teaching the Vietnam War," 193-209. Casey, Kevin M., "Greater Expectations: Teaching and Assessing for Academic Skills and Knowledge in the General Education History Classroom," 171-81. "Doing Original Research in an Undergraduate Environmental History Course," by Robert M. Rakoff, 29-37. "Eastern European Elites: Teaching About Aristocrats in the AP Curriculum," by Ellis Archer Wasson, 39-49. Ghere, David, co-auth., "Teaching Japanese-American Incarceration," 211-27. "Greater Expectations: Teaching and Assessing for Academic Skills and Knowledge in the General Education History Classroom," by Kevin M. Casey, 171-81. Howlett, Charles, "Public Opinion on Long Island about the Vietnam War: A School Year Project Using Local Sources and Perspectives in the Classroom and in Student Research Papers," 457-72. "Improving Critical Thinking Skills in the United States Survey Course: An Activity for Teaching the Vietnam War," by Wilson J. Warren, David M. Memory, and Kevin Bolinger, 193-209. Lyons, John F., "Teaching U.S. History Online: Problems and Prospects," 447-56. Memory, David M., co-auth., "Improving Critical Thinking Skills in the United States Survey Course: An Activity for Teaching the Vietnam War," 193-209. Miksch, Karen L., co-auth., "Teaching Japanese-American Incarceration," 211-27. Musselman, Elizabeth Green, "Using Structured Debate to Achieve Autonomous Student Discussion," 335-49. "Popular Culture and the Teaching of History: The Modern Caribbean History Course," by Kirwin R. Shaffer, 365-83. "Public Opinion on Long Island about the Vietnam War: A School Year Project Using Local Sources and Perspectives in the Classroom and in Student Research Papers," by Charles Howlett, 457-72. Rakoff, Robert M., "Doing Original Research in an Undergraduate Environmental History Course," 29-37. Scappini, Robert A., "Teaching High School History in the Context of Performance Based Standards: An Innovative Approach for Urban Schools," 183-91. Shaffer, Kirwin R., "Popular Culture and the Teaching of History: The Modern Caribbean History Course," 365-83. Sipress, Joel M., "Why Students Don't Get Evidence and What We Can Do About It," 351-63. "Teaching America's GAPE (or any other period) with Political Cartoons: A Systematic Approach to Primary Source Analysis," by Samuel J. Thomas, 425-46. "Teaching High School History in the Context of Performance Based Standards: An Innovative Approach for Urban Schools," by Robert A. Scappini, 183-91. "Teaching Japanese-American Incarceration," by Karen L. Miksch and David Ghere, 211-27. "Teaching U.S. History Online: Problems and Prospects," by John F. Lyons, 447-56. Thomas, Samuel J., "Teaching America's GAPE (or any other period) with Political Cartoons: A Systematic Approach to Primary Source Analysis," 425-46. "Using Structured Debate to Achieve Autonomous Student Discussion," by Elizabeth Green Musselman, 335-49. Warren, Wilson J., co-auth., "Improving Critical Thinking Skills in the United States Survey Course: An Activity for Teaching the Vietnam War," 193-209. Wasson, Ellis Archer, "Eastern European Elites: Teaching About Aristocrats in the AP Curriculum," 39-49. "Why Students Don't Get Evidence and What We Can Do About It," by Joel M. Sipress, 351-63. "'And, We Burned Down the White House, Too': American History, Canadian Undergraduates, and Nationalism," by James Tagg, 309-34. 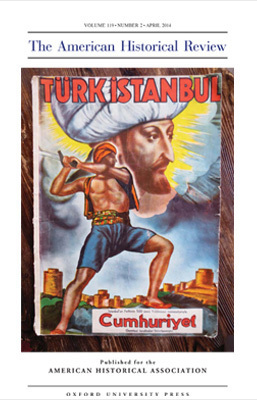 "Internationalizing United States History-Editor's Note," by Nancy Quam-Wickham, 153-54, 307-08. Kibler, M. Alison, "Settling Accounts with Settler Societies: Strategies for Using Australian Women's History in a United States Women's History Class," 155-70. Quam-Wickham, Nancy, "Internationalizing United States History-Editor's Note," 153-54, 307-08. "Settling Accounts with Settler Societies: Strategies for Using Australian Women's History in a United States Women's History Class," by M. Alison Kibler, 155-70. Tagg, James, "'And, We Burned Down the White House, Too': American History, Canadian Undergraduates, and Nationalism," 309-34. "Idea of History Teaching, The: Using Collingwood's Idea of History to Promote Critical Thinking in the High School History Classroom," by Anthony E. Pattiz, 239-49. Pattiz, Anthony E., "The Idea of History Teaching: Using Collingwood's Idea of History to Promote Critical Thinking in the High School History Classroom," 239-49. Pineo, Ronn, "Recent Cold War Studies," 79-86. "Recent Cold War Studies," by Ronn Pineo, 79-86. Taylor, Julie A., "Teaching History at America's #1 High School," 517-31. 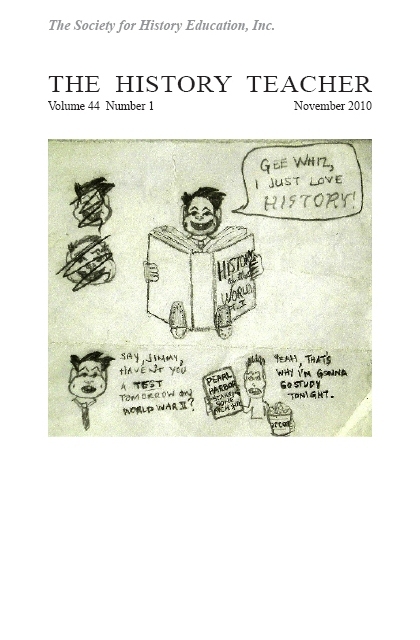 "Teaching History at America's #1 High School," by Julie A. Taylor, 517-31. "History in the Digital Age: A Study of the Impact of Interactive Resources on Student Learning," by Deborah Vess, 385-99. Vess, Deborah, "History in the Digital Age: A Study of the Impact of Interactive Resources on Student Learning," 385-99. A Citizen Soldier's Civil War: The Letters of Brevet Major General Alvin C. Boris, ed. by Jerome Mushkat, revd., 130-31. A Concise History of Byzantium, by Warren Treadgold, revd., 136. African American Women Confront the West, 1600-2000, ed. by Quintard Taylor and Shirley Ann Wilson Moore, revd., 545-46. African Military History and Politics: Coups and Ideological Incursions, 1900-Present, by A.B. Assensoh and Yvette M. Alex-Assensoh, revd., 251-52. Alex-Assensoh, Yvette M., African Military History and Politics: Coups and Ideological Incursions, 1900-Present, revd., 251-52. Alonso, Harriet Hyman, ed., Women at The Hague: The International Congress of Women and Its Results, revd., 533-34. Alonso, Harriet Hyman, Growing Up Abolitionist: The Story of the Garrison Children, revd., 119-20. Ambrosius, Lloyd F., Wilsonianism: Woodrow Wilson and His Legacy in American Foreign Relations, revd., 120-21. American Colonial State in the Philippines, The: Global Perspectives, ed. by Julian Go and Anne L. Foster, revd., 254-56. American Railroads in the Nineteenth Century, by Augustus J. Veenendaal, revd., 546-47. An Introduction to Roman Religion, by John Scheid., trans. by Janet Lloyd, revd., 406-07. Anders, Tisa M., rev., Women at The Hague: The International Congress of Women and Its Results, ed. by Harriet Hyman Alonso, 533-34. Andrian, Robert K., co-auth., Exploring World History: Ideas for Teachers, revd., 411-12. Aronson, Marc, Witch-Hunt: Mysteries of the Salem Witch Trials, revd., 401-02. Assensoh , A.B., co-auth., African Military History and Politics: Coups and Ideological Incursions, 1900-Present, revd., 251-52. Atlas of American Military History, ed. by James C. Bradford, revd., 402. Baker. Lee, rev., World War II through Polish Eyes: In the Nazi-Soviet Grip, by M.B. 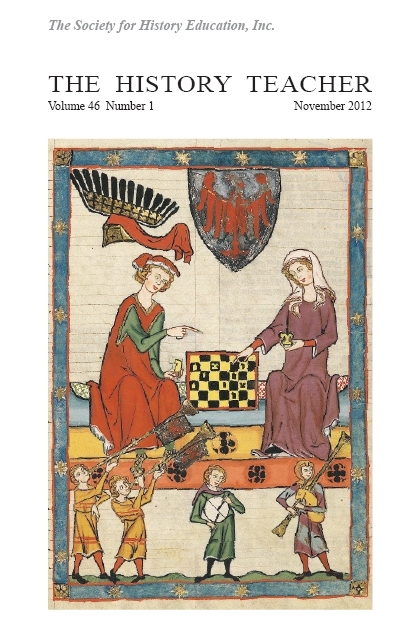 Szonert, 133-34. Barber, Lucy G., Marching on Washington, The Forging of an American Political Tradition, revd., 534-35. Barton, Michael, co-ed., The Civil War Soldier: A Historical Reader, revd., 122. Baugess, James S., rev., Emancipation and Reconstruction, 2nd edition, by Michael Perman, 263-64. Bentley, Judith, rev., Marching on Washington, The Forging of an American Political Tradition, by Lucy G. Barber, 534-35. Bielakowski, Alexander M., rev., African Military History and Politics: Coups and Ideological Incursions, 1900-Present, by A.B. Assensoh and Yvette M. Alex-Assensoh, 251-52. Bielakowski, Alexander M., rev., Atlas of American Military History, ed. by James C. Bradford, 402. Blackman, Robert H., rev., Exploring World History: Ideas for Teachers, by Mark Williams, Lou Ratté and Robert K. Andrian, 411-12. Bledstein, Burton J., rev., Understanding Emerson: "The American Scholar" and His Struggle For Self-Reliance, by Kenneth Sacks, 265-67. Booker T. Washington, W.E.B. Du Bois, and the Struggle for Racial Uplift, by Jacqueline M. Moore, revd., 539-40. Booker, Jackie R., rev., African American Women Confront the West, 1600-2000, ed. by Quintard Taylor and Shirley Ann Wilson Moore, 545-46. Boyd, Newell D., rev., British Imperialism, by Robert Johnson, 537-38. Bradford, James C., ed., Atlas of American Military History, revd., 402. British Imperialism, by Robert Johnson, revd., 537-38. Brown, D. Clayton, Globalization and America since 1945, revd., 252-53. Browne, Blaine T., rev., Globalization and America since 1945, by D. Clayton Brown, 252-53. Cantu, D. Antonio, rev., Statue of Liberty National Monument and Ellis Island Teaching Guide, The [Lesson Plans], by National Park Service, 541-42. Carp, E. Wayne, rev., Welfare: A Documentary History of U.S. Policy and Politics, by Gwendolyn Mink and Rickie Solinger, 538-39. Chaucer's England, by Diana Childress, revd., 536-37. Chernus, Ira, General Eisenhower: Ideology and Discourse, revd., 123-24. Childress, Diana, Chaucer's England, revd., 536-37. Church and State in American History: Key Documents, Decisions, and Commentary From the Past Three Centuries, 3rd ed., ed. by John F. Wilson and Donald L. Drakeman, revd., 137-38. Civil War Soldier, The: A Historical Reader, by Michael Barton and Larry M. Logue, eds., revd., 122. Civilising Subjects: Metropole and Colony in the English Imagination 1830-1867, by Catherine Hall, revd., 256-57. Clark, Charles W., rev., Witch-Hunt: Mysteries of the Salem Witch Trials, by Marc Aronson, 401-02. Cohen, Robert, ed., Dear Mrs. Roosevelt: Letters from Children of the Great Depression, revd., 124-25. Collins , Theresa M., co-auth., Thomas Edison and Modern America: A Brief History with Documents, revd., 125-26. Collins, Sam, rev., A Concise History of Byzantium, by Warren Treadgold, 136. Columbia Guide to American Indians of the Great Plains, The, by Loretta Fowler, revd., 253-54. Daisy Bates: Civil Rights Crusader, by Amy Polakow, revd., 264-65. Dear Mrs. Roosevelt: Letters from Children of the Great Depression, ed. by Robert Cohen, revd., 124-25. Dewdrops, Waldos, and Slackers: A Decade-by-Decade Guide to the Vanishing Vocabulary of the Twentieth Century, by Rosemarie Ostler, revd., 405-06. Divine, Donna Robinson, rev., Israel Challenges to Identity, Democracy and the State, by Clive Jones and Emma C. Murphy, 259-60. Doody, William E., rev., Daisy Bates: Civil Rights Crusader, by Amy Polakow, 264-65. Doody, William E., rev., The Medicine of Memory: A Mexica Clan in California, by Alejandro Murguía, 129-30. Drabble, John, rev., The Holy Profane: Religion in Black Popular Music, by Teresa L. Reed, 132-33. Drakeman, Donald L., co-ed., Church and State in American History: Key Documents, Decisions, and Commentary From the Past Three Centuries, 3rd ed., revd., 137-38. Edwards, Gary T., rev., The Civil War Soldier: A Historical Reader, ed. by Michael Barton and Larry M. Logue, 122. Emancipation and Reconstruction, 2nd edition, by Michael Perman, revd., 263-64. Encyclopedia of Cuba: People, History, Culture, 2 vols., ed. by Luis Martínez-Fernández, D.H. Figueredo, Louis A. Perez, Jr., and Luis González, revd., 262-63. Evolutionary Theory and Victorian Culture, by Martin Fichman, revd., 127-28. Exploring World History: Ideas for Teachers, by Mark Williams, Lou Ratté and Robert K. Andrian, revd., 411-12. Fahey, David M., rev., Evolutionary Theory and Victorian Culture, by Martin Fichman, 127-28. Fichman, Martin, Evolutionary Theory and Victorian Culture, revd., 127-28. Figueredo, D.H., co-ed., Encyclopedia of Cuba: People, History, Culture, 2 vols., revd., 262-63. Foster, Anne L., co-ed., The American Colonial State in the Philippines: Global Perspectives, revd., 254-56. Fowler, Loretta, The Columbia Guide to American Indians of the Great Plains, revd., 253-54. Friedman, Hal M., rev., The American Colonial State in the Philippines: Global Perspectives, ed. by Julian Go and Anne L. Foster, 254-56. Gannon, Kevin. rev., Growing Up Abolitionist: The Story of the Garrison Children, by Harriet Hyman Alonso, 119-20. General Eisenhower: Ideology and Discourse, by Ira Chernus, revd., 123-24. Gitelman, Lisa, co-auth., Thomas Edison and Modern America: A Brief History with Documents, revd., 125-26. Globalization and America since 1945, by D. Clayton Brown, revd., 252-53. Go, Julian, co-ed., The American Colonial State in the Philippines: Global Perspectives, revd., 254-56. González, Luis, co-ed., Encyclopedia of Cuba: People, History, Culture, 2 vols., revd., 262-63. Gormly, James L., rev., General Eisenhower: Ideology and Discourse, by Ira Chernus, 123-24. Groundbreaking Scientific Experiments, Inventions and Discoveries of the 18th Century, by Jonathan Shectman, revd., 544-45. Growing Up Abolitionist: The Story of the Garrison Children, by Harriet Hyman Alonso, revd., 119-20. Hall, Catherine, Civilising Subjects: Metropole and Colony in the English Imagination 1830-1867, revd., 256-57. Heidenreich, Linda, rev., Spain in the Southwest: A Narrative History of Colonial New Mexico, Arizona, Texas, and California, by John L. Kessell, 260-61. Herzenberg, Caroline L., co-auth., Their Day in the Sun: Women of the Manhattan Project, revd., 258-59. History in the Present Tense: Engaging Students Through Inquiry and Action, by Douglas Selwyn and Jan Maher, revd., 407-08. History of Argentina, The, by Daniel K. Lewis, revd., 402-04. Hoffman, Abraham, rev., Race and Homicide in Nineteenth-Century California, by Clare V. McKanna, Jr., 128-29. Hollywood's White House: the American Presidency in Film and History, ed. by Peter C. Rollins and John E. O'Conner, fwd. by Richard Shenkman, revd., 542-43. Holy Profane, The: Religion in Black Popular Music, by Teresa L. Reed, revd., 132-33. Holzapfel, Richardd Neitzel, rev., Western Civilization in World History, by Peter N. Stearns, 410-11. Hortua, Giovanni, rev., Encyclopedia of Cuba: People, History, Culture, 2 vols., ed. by Luis Martínez-Fernández, D.H. Figueredo, Louis A. Perez, Jr., and Luis González, 262-63. Howes, Ruth H., co-auth., Their Day in the Sun: Women of the Manhattan Project, revd., 258-59. Israel Challenges to Identity, Democracy and the State, by Clive Jones and Emma C. Murphy, revd., 259-60. Johnson, Robert, British Imperialism, revd., 537-38. Jones, Clive, co-auth., Israel Challenges to Identity, Democracy and the State, revd., 259-60. Kemp, Mark D., rev., A Citizen Soldier's Civil War: The Letters of Brevet Major General Alvin C. Boris, ed. by Jerome Mushkat, 130-31. Kessell, John L., Spain in the Southwest: A Narrative History of Colonial New Mexico, Arizona, Texas, and California, revd., 260-61. Lewis, Daniel K., The History of Argentina, revd., 402-04. Library of America, Reporting Civil Rights: Part One: American Journalism, 1941-1963 and Reporting Civil Rights: Part Two: American Journalism, 1963-1973, revd., 404-05. Lloyd, Janet, trans., An Introduction to Roman Religion, revd., 406-07. Logue, Larry M., co-ed., The Civil War Soldier: A Historical Reader, revd., 122. 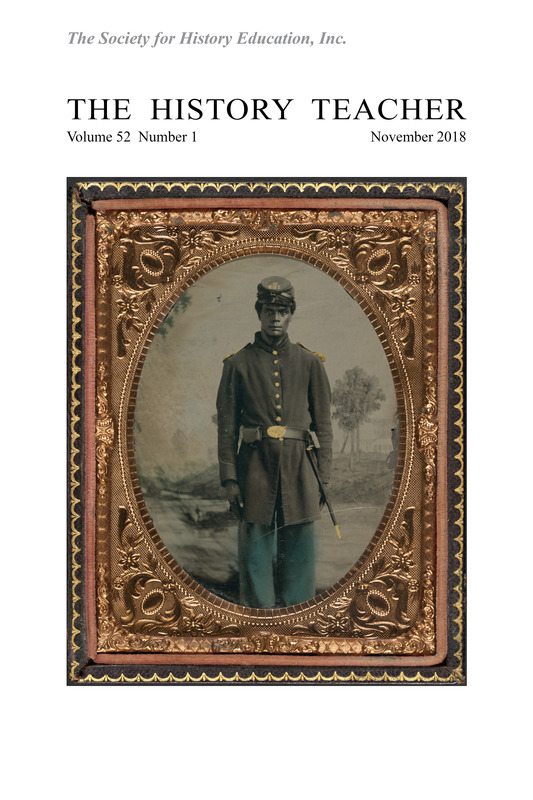 Long, Michael E., rev., The Reconstruction Desegregation Debate: The Politics of Equality and the Rhetoric of Place, 1870-1875, by Kirt H. Wilson, 138-39. Maher, Jan, co-auth., History in the Present Tense: Engaging Students Through Inquiry and Action, revd., 407-08. Marching on Washington, The Forging of an American Political Tradition, by Lucy G. Barber, revd., 534-35. Martínez-Fernández, Luis, co-ed., Encyclopedia of Cuba: People, History, Culture, 2 vols., revd., 262-63. McGowan, Barbara, rev., Their Day in the Sun: Women of the Manhattan Project, by Ruth H. Howes and Caroline L. Herzenberg, fwd. by Ellen C. Weaver, 258-59. McKanna, Jr., Clare V., Race and Homicide in Nineteenth-Century California, revd., 128-29. Medicine of Memory, The: A Mexica Clan in California, by Alejandro Murguía, revd., 129-30. Mink, Gwendolyn, co-auth., Welfare: A Documentary History of U.S. Policy and Politics, revd., 538-39. Mooney, Matthew, rev., Dewdrops, Waldos, and Slackers: A Decade-by-Decade Guide to the Vanishing Vocabulary of the Twentieth Century, by Rosemarie Ostler, 405-06. Mooney, Matthew, rev., Hollywood's White House: the American Presidency in Film and History, ed. by Peter C. Rollins and John E. O'Conner, fwd. by Richard Shenkman, 542-43. Moore, Jacqueline M., Booker T. Washington, W.E.B. Du Bois, and the Struggle for Racial Uplift, revd., 539-40. Moore, Shirley Ann Wilson, co-ed., African American Women Confront the West, 1600-2000, revd., 545-46. Murguía, Alejandro, The Medicine of Memory: A Mexica Clan in California, revd., 129-30. Murphy, Emma C., co-auth., Israel Challenges to Identity, Democracy and the State, revd., 259-60. Mushkat, Jerome, ed., A Citizen Soldier's Civil War: The Letters of Brevet Major General Alvin C. Boris, revd., 130-31. National Park Service, The Statue of Liberty National Monument and Ellis Island Teaching Guide [Lesson Plans], revd., 541-42. Nichols, Roger L., rev., American Railroads in the Nineteenth Century, by Augustus J. Veenendaal, 546-47. Noonkester, Myron C., rev., Civilising Subjects: Metropole and Colony in the English Imagination 1830-1867, by Catherine Hall, 256-57. O'Conner, John E., co-ed., Hollywood's White House: the American Presidency in Film and History, revd., 542-43. Ostler, Rosemarie, Dewdrops, Waldos, and Slackers: A Decade-by-Decade Guide to the Vanishing Vocabulary of the Twentieth Century, revd., 405-06. Perez, Jr., Louis A., co-ed., Encyclopedia of Cuba: People, History, Culture, 2 vols., revd., 262-63. Perman, Michael, Emancipation and Reconstruction, 2nd edition, revd., 263-64. Pineo, Ronn, rev., The History of Argentina, by Daniel K. Lewis, 402-04. Polakow, Amy, Daisy Bates: Civil Rights Crusader, revd., 264-65. Porter, J.M.B., rev., Chaucer's England, by Diana Childress, 536-37. Porterfield, Amanda, rev., Church and State in American History: Key Documents, Decisions, and Commentary From the Past Three Centuries, 3rd ed., ed. by John F. Wilson and Donald L. Drakeman, 137-38. Race and Homicide in Nineteenth-Century California, by Clare V. McKanna, Jr., revd., 128-29. Ratté, Lou, co-auth., Exploring World History: Ideas for Teachers, revd., 411-12. Reconstruction Desegregation Debate, The: The Politics of Equality and the Rhetoric of Place, 1870-1875, by Kirt H. Wilson, revd., 138-39. Reed, Teresa L., The Holy Profane: Religion in Black Popular Music, revd., 132-33. Reel History: In Defense of Hollywood, by Robert Brent Toplin, revd., 134-35. Reese Jr., Garth D., rev., Groundbreaking Scientific Experiments, Inventions and Discoveries of the 18th Century, by Jonathan Shectman, 544-45. Reid, David A., rev., Thomas Edison and Modern America: A Brief History with Documents, by Theresa M. Collins and Lisa Gitelman, 125-26. Reporting Civil Rights: Part One: American Journalism, 1941-1963 and Reporting Civil Rights: Part Two: American Journalism, 1963-1973, by Library of America, revd., 404-05. Rollins, Peter C., co-ed., Hollywood's White House: the American Presidency in Film and History, revd., 542-43. Rosenberg, Jonathan , rev., Reporting Civil Rights: Part One: American Journalism, 1941-1963 and Reporting Civil Rights: Part Two: American Journalism, 1963-1973, by Library of America, 404-05. Rung, Margaret, rev., Dear Mrs. Roosevelt: Letters from Children of the Great Depression, ed. by Robert Cohen, 124-25. Rust, Thomas C., rev., Columbia Guide to American Indians of the Great Plains, The, by Loretta Fowler, 253-54. Rust, Thomas C., rev., Voyages of Delusion: The Quest for the Northwest Passage, by Glyn Williams, 547-48. Sacks, Kenneth, Understanding Emerson: "The American Scholar" and His Struggle For Self-Reliance, revd., 265-67. Scheid, John, An Introduction to Roman Religion, revd., 406-07. Selwyn, Douglas, co-auth., History in the Present Tense: Engaging Students Through Inquiry and Action, revd., 407-08. Shectman, Jonathan, Groundbreaking Scientific Experiments, Inventions and Discoveries of the 18th Century, revd., 544-45. Shedd, John, rev., History in the Present Tense: Engaging Students Through Inquiry and Action, by Douglas Selwyn and Jan Maher, 407-08. Shenkman, Richard, fwd., Hollywood's White House: the American Presidency in Film and History, revd., 542-43. Solinger, Rickie, co-auth., Welfare: A Documentary History of U.S. Policy and Politics, revd., 538-39. Spain in the Southwest: A Narrative History of Colonial New Mexico, Arizona, Texas, and California, by John L. Kessell, revd., 260-61. Spongberg, Mary, Writing Women's History Since the Renaissance, revd., 409-10. Statue of Liberty National Monument and Ellis Island Teaching Guide, The [Lesson Plans], by National Park Service, revd., 541-42. Stearns, Peter N., Western Civilization in World History, revd., 410-11. Stewart, Matthew, rev., Reel History: In Defense of Hollywood, by Robert Brent Toplin, 134-35. Szonert, M.B., World War II through Polish Eyes: In the Nazi-Soviet Grip, revd., 133-34. Taylor, Quintard, co-ed., African American Women Confront the West, 1600-2000, revd., 545-46. Their Day in the Sun: Women of the Manhattan Project, by Ruth H. Howes and Caroline L. Herzenberg, fwd. by Ellen C. Weaver, revd., 258-59. Thigpen, Jennifer, rev., Writing Women's History Since the Renaissance, by Mary Spongberg, 409-10. 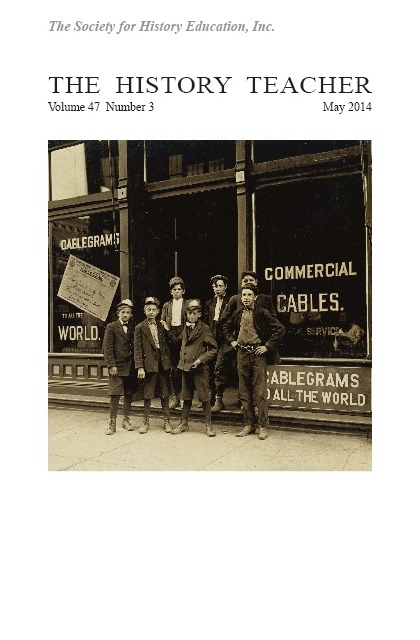 Thomas Edison and Modern America: A Brief History with Documents, by Theresa M. Collins and Lisa Gitelman, revd., 125-26. Toplin, Robert Brent, Reel History: In Defense of Hollywood, revd., 134-35. Treadgold, Warren., A Concise History of Byzantium, revd., 136. Understanding Emerson: "The American Scholar" and His Struggle For Self-Reliance, by Kenneth Sacks, revd., 265-67. Veenendaal, Augustus J., American Railroads in the Nineteenth Century, revd., 546-47. Voyages of Delusion: The Quest for the Northwest Passage, by Glyn Williams, revd., 547-48. Weaver, Ellen C., fwd., Their Day in the Sun: Women of the Manhattan Project, revd., 258-59. Welfare: A Documentary History of U.S. Policy and Politics, by Gwendolyn Mink and Rickie Solinger, revd., 538-39. Wells, Jack, rev., An Introduction to Roman Religion, by John Scheid, trans. by Janet Lloyd, 406-07. Western Civilization in World History, by Peter N. Stearns, revd., 410-11. Williams, Glyn, Voyages of Delusion: The Quest for the Northwest Passage, revd., 547-48. Williams, Jeffrey, rev., Wilsonianism: Woodrow Wilson and His Legacy in American Foreign Relations, by Lloyd F. Ambrosius, 120-21. Williams, Mark, co-auth., Exploring World History: Ideas for Teachers, revd., 411-12. Williams, Reginnia N., rev., Booker T. Washington, W.E.B. Du Bois, and the Struggle for Racial Uplift, by Jacqueline M. Moore, 539-40. Wilson, John F., co-ed., Church and State in American History: Key Documents, Decisions, and Commentary From the Past Three Centuries, 3rd ed., revd., 137-38. Wilson, Kirt H., The Reconstruction Desegregation Debate: The Politics of Equality and the Rhetoric of Place, 1870-1875, revd., 138-39. Wilsonianism: Woodrow Wilson and His Legacy in American Foreign Relations, by Lloyd F. Ambrosius, revd., 120-21. Witch-Hunt: Mysteries of the Salem Witch Trials, by Marc Aronson, revd., 401-02. Women at The Hague: The International Congress of Women and Its Results, ed. by Harriet Hyman Alonso, revd., 533-34. World War II through Polish Eyes: In the Nazi-Soviet Grip, by M.B. Szonert, revd., 133-34. Writing Women's History Since the Renaissance, by Mary Spongberg, revd., 409-10.